The finest filter plugin ever made? The Drop's staggering wealth of functionality, sensible design and great price make it a no-brainer for any producer who uses filters. Fabulous-sounding filter models. Spread knob is a great creative tool. Audio rate LFO. External MIDI and FM input. LFO2 is an absolute beast. Very reasonably priced. Steepest slope available is 24dB/octave. The follow-up to The Glue, Cytomic's acclaimed character bus compressor, has been available in beta form for what seems like an eternity, and now that the finished version is finally here, we're happy to report that it's turned out every bit as special as we hoped and expected it to. Indeed, The Drop is arguably the finest filter plugin ever made, with a superlative sound and extensive feature set. Taking the exact opposite approach to the 'one-knob' likes of Sonalksis' Creative Filter and Waves' OneKnob Filter, The Drop harks back to the intimidating complexity of Antares Filter - a frankly terrifying (discontinued) plugin fair bristling with parameters and controls. 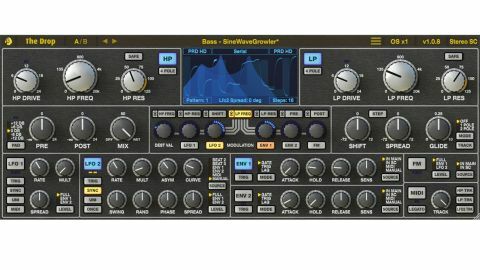 "Those who are serious about sound quality will be pleased to learn that the plugin also includes a number of oversampling options"
Thankfully, though, while The Drop has more than enough knobs to play with, accessing its basic functionality is pretty straightforward: the plugin (VST/AU/RTAS) centres on a pair of filters - low-pass and high-pass - which are located right at the top of the interface and boast big, inviting Frequency, Resonance and Drive controls. The filters self-oscillate when driven hard, but the Safe button on each one keeps the resonance below self-oscillation level when activated. The Filters can be routed in series or parallel, and the 4 Pole buttons toggle them between 12 and 24dB/octave modes. The Drop doesn't offer the steep 48 and 96dB/ octave roll-offs served up by the likes of Sugar Bytes WOW2 and Vengeance Philta XL, but it does feature seven circuit models based on filters from classic hardware synths: the Roland SH-101 and Juno-6, the Oxford Synthesiser Company OSCar, the Moog Prodigy, two variations on the Korg MS-20, and a custom circuit somewhere between a Sallen-Key and a state variable filter. They're all much alike until you crank the Drive knob, at which point their individual characteristics become apparent and The Drop's ability to imbue glorious analogue-style filth is realised. Some of the modes have Medium Definition variants as well as the default High Definition, giving slightly less authentic results in exchange for a lower, fixed amount of CPU usage. The Drop isn't a CPU hog by any means, but this is a thoughtful addition, and those who are serious about sound quality will be pleased to learn that the plugin also includes a number of oversampling options, up to 16x in real-time and a whopping 64x in rendering mode. The Drop also has an Amp section with Pre and Post levels controls, a Mix knob for parallel processing, and a Pad function that locks the input level at +/-6, +/-12 or 0dB and applies the opposite at the output stage, for optimising the feed into the drive circuit and envelope followers without changing the output level. That's all very handy, but what's more interesting is the Cutoff Section on the right, where you can start to get creative with the dual filters. The Shift knob controls the frequencies of the low-pass and high-pass filters together - in Serial mode it can be used to combine the two into a band-pass filter; in parallel mode, it turns them into a notch filter. The Spread knob offsets the cutoff frequencies between the left and right channels - ideal for creating rhythmic stereo pads. Glide, meanwhile, increasingly smooths out (via interpolation) movement of the Cutoff section's parameters - important when using host automation to control the Shift and Spread. The Shift and Spread controls really come into their own when combined with filter cutoff modulation. The Modulation section looks a bit confusing at first, but it's really very simple: select a modulation target at the top of the panel, then adjust the knob for a source to set the depth to which its modulation is applied to that target. "The Drop is packed with powerful, fun and genuinely useful features"
The ambiguous-looking icon to the left of each destination name bypasses modulation on that routing, and clicking a source brings up a graphical representation of its movement in the Visualiser display at the top centre of the interface. While LFO1 is a straightforward sine wave generator, LFO2 is far more sophisticated. It can be morphed from its default triangle wave to sawtooth and pulse shapes, and even works as a step sequencer (edited directly in the Visualiser), with between two and 32 steps, and Swing and Phase settings. Both LFOs can be toggled between bipolar and unipolar modes, synced to host tempo, and run at rates up to 32Hz - although the nifty Rate Multiply knob (up to x32.768) can easily send them into audio territory for exciting lo-fi and synth-style effects. Finally, two envelope followers are also onboard, and various other signals can be pressed into service as modulation sources, too. The Drop is packed with powerful, fun and genuinely useful features, making it a fantastic plugin for anyone who uses filters creatively. While it has plenty of potential as a complex sound design tool, it can also be used at a very basic level, giving it truly universal appeal. Crucially, no matter how deep you choose to go with it, it always sounds absolutely superb.